Yellen rejects more oversight of Fed as House Republicans criticize her. Federal Reserve Chair Janet Yellen delivered an upbeat message on the economic outlook to lawmakers and parried attacks from Republicans who say the central bank is too secretive and needs stronger oversight. Yellen repeated that the Fed is likely to raise its main interest rate this year, assuming its forecasts for stronger growth and lower unemployment are realized. The first rate increase in almost a decade “will signal how much progress the economy has made in healing from the trauma of the financial crisis,” Yellen, 68, told members of the House Financial Services Committee on Wednesday. Seeking to reassure investors accustomed to more than six years of near-zero borrowing costs, she emphasized that the timing of liftoff is less important than the subsequent pace of increases, which she said would be gradual. Policy will probably remain “highly accommodative for quite some time,” she said. During more than two hours of questions and answers, Yellen defended the Fed’s record on monetary policy and bank regulation, and she disputed suggestions from Republicans that the central bank would do better to follow a formula or rule for setting rates. In the most heated exchanges, Yellen came under fire from Republican committee members over the Fed’s refusal to fully comply with a subpoena for documents relating to a 2012 leak of confidential policy deliberations. Jeb Hensarling, the Texas Republican who heads the Financial Services Committee, said the Fed had “crossed the line” by failing to provide the documents. Yellen said the Fed is seeking to cooperate with the committee and that complying with the subpoena would interfere with an existing criminal investigation by the Department of Justice. “We fully intend to cooperate with you to provide the documents you requested but we are not going to provide them now,” she said in a heated exchange with Sean Duffy of Wisconsin, who heads the committee’s investigative panel. “Madame chair, it appears that you are the one who is jeopardizing, or the Fed is the one who is jeopardizing, this investigation,” Duffy said. Yellen also used her prepared testimony to respond to Republican charges that the Fed is insufficiently transparent and needs stricter oversight by Congress. 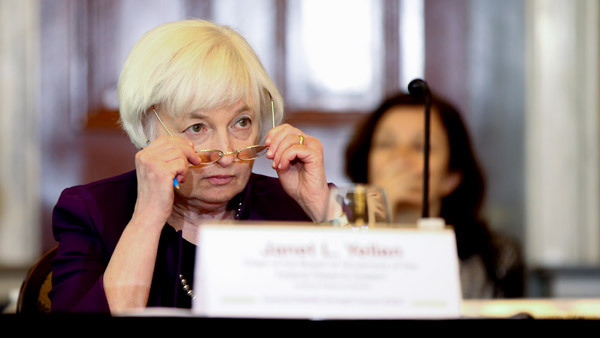 She cited the Fed chair’s quarterly press conferences, the publication of central bank officials forecasts for the economy and interest rates and the adoption on an explicit inflation target among recent efforts to improve transparency. Responding to questions, Yellen said that the Fed could decide to raise rates at any meeting, not just those that are typically followed by a previously scheduled press conference. She also said that raising rates sooner could allow the Fed to follow a more gradual path later, while waiting to tighten could mean a faster pace. Stocks and Treasury yields fell as protesters in Athens clashed with police as Greece’s parliament began to debate a bailout package. The Standard & Poor’s 500 Index was down 0.2 percent to 2,104.35 at 3:02 p.m. in New York. The yield on the 10-year Treasury note slid five basis points, or 0.05 percentage point, to 2.35 percent. Yellen’s testimony on the economy was similar to a speech she gave on July 10. She again acknowledged concerns over the situation in Greece and added China to her list of overseas risks. Forecasts issued by the Federal Open Market Committee in June implied two quarter-point rate rises this year, followed by a shallower path of increases than officials predicted in March. At the same time, a larger number of officials said just one would be enough. The Fed is likely to make its first move in September, according to 76 percent of 51 economists surveyed by Bloomberg from July 2 to July 8. Futures traders are less confident. A Morgan Stanley index based on futures trading shows the Fed won’t act until early 2016, while federal funds futures show the probability for a move in September of 40 percent. The Fed chair took note of progress in a labor market that has generated more than 2.9 million jobs in the past 12 months. Unemployment fell in June to 5.3 percent, its lowest in more than seven years. Yellen will complete her semi-annual congressional testimony tomorrow before the Senate Banking Committee. Headed by Alabama Republican Richard Shelby, that panel in May approved a proposal that would ease regulations for mid-sized banks and toughen oversight of the Fed.